Director of two documentary features, La Bañeza Grand Prix and Via Estrecha. At Kantar Media Intelligence, he is currently in charge of the Daily Press Review and the Daily Press Summary for the European Commission. Previously, he worked for the Programming Office of Locarno Film Festival. Master in Journalism at Complutense University of Madrid. Following his research about the story of Motorcycling in Spain, he published “Ecos de una pasión“, about the history of motoracing in Spain. 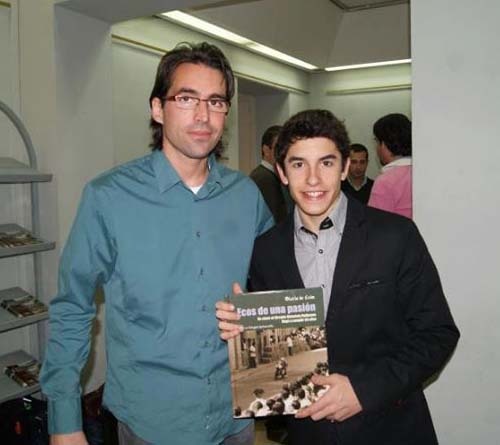 Marc Marquez, MOTOGP World Champion with Oscar Falagán and his book “Ecos de una pasión”. At the moment, Oscar Falagán is developping a new documentary feature: Via Francigena.